People with binocular vision dysfunctions experience vision and learning problems because their eyes do not work together as a team properly. Indeed, good binocular vision can be important ingredient in climbing the ladder of success. Most developmental optometrists have stories of patients whose academic behaviours and performance have improved following vision therapy treatment of their binocular vision problems. Research studies have shown the same results. Accomodatedive disorders: the inability of the eyes to focus. The eyes must be able to sustain focus for long periods of time when doing near work. Also, the eyes must be able to quickly and accurately change focus from distant to near objects. Convergence disorders: the inability to use both eyes as a team when looking at something up close. When looking at near objects, both eyes should turn inwards and maintain single vision. Divergence disorders: the inability to use both eyes as a team when looking at something in the distance. When looking at far away objects, both eyes should turn outwards and maintain single vision. Oculomotor disorders: the inability to quickly and accurately move our eyes. These are sensory motor skills that allow us to move our eyes so that we can fixate on objects (fixation), move our eyes smoothly from point to point as in reading (saccades) and to track a moving object (pursuits). A 2010 study published in the journal BMC Ophthalmology by Dusek at al. investigated the visual functioning of two groups of school-aged children in Austria - one group that was diagnosed with reading and writing difficulties and the other which was a clinical age-matched control group. The study found that the group of children with reading difficulties was statistically more likely to have visual problems such as poorer distance visual acuity, an binocular problems such as exophoric deviation at near, a lower amplitude of accommodation, reduced accommodative facility, reduced vergence facility, a reduced near point of convergence, a lower AC/A ratio and a slower reading speed. The study confirmed the importance of a full assessment of binocular visual status in order to detect and remedy these deficits in order to prevent the visual problems continuing to impact upon educational development. Similar results come from a 2007 American study by Grisham et al. published in the Journal Optometry that measured visual skills and visual acuity in 461 students with an average age of 15.4 years in four California high schools within the same school district. Participating students had been identified by their schools as poor readers. In the studied sample, 80% of the students were found to be inadequate or weak in one or more of the following binocular visual skills: binocular fusion ranges at near, accommodative facility, and convergence near point. In contrast, only 17% had deficient visual acuity—20/40 or worse in one eye— which is the standard model of deficiency for school vision screenings. This demonstrates not only the inadequacy of school vision screenings but also that academic deficits are correlated much more strongly with binocular vision problems (which can’t be fixed with corrective lenses) rather than with acuity (which can be fixed with corrective lenses). How prevalent is binocular dysfunction among students? A 1997 study by Porcar and Martinez-Polomero published in the journal Optometry and Vision Science concluded that acommodative and nonstrabismic binocular vision problems are prevalent in the university population. Accommodative excess is the most common condition. Because these dysfunctions have a negative effect on performance, appropriate vision evaluation for this population is important. The researchers concluded that among university students, 32.3% showed general binocular dysfunctions. In 10.8% of the cases, accommodative excess was present. 7.7% had convergence insufficiency with accommodative excess. 6.2% showed accommodative insufficiency. 3.1% had basic exophoria. More recently, a longitudinal study was published by Jorge et al. in 2008 in Optometry and Vision Science the purpose of which was to investigate the changes in accommodation and binocular vision parameters during a 3-year period. The research team found significant changes in near heterophoria, fusional vergences, and positive relative accommodation. These two studies indicate that binocular dysfunction is not rare in university students and that the demands of university appear to worsen binocular vision over time. No post on binocular vision disorders would be complete without mentioning convergence insufficiency, which is the most common binocular vision disorder with a prevalence of around 15% according to some studies. A study published earlier this year demonstrated that treatment of convergence insufficiency with vision therapy improved academic behaviors. Computer vision syndrome is a vision problem that is growing with the proliferation of computer work, smart phones and tablets. There is an app for everything these days and that means that more and more of our time is spent looking at ipad, iphone and computer screens for long periods. Patients in our clinic have experienced benefits from using custom designed computer lenses combined with the right prescription to substantially reduce computer vision syndrome and visual fatigue. Computer vision lenses are designed for a 21st century digital lifestyle. Some even have a precise wrap designed to increase the humidity directly in front of your eyes to combat dry eye, a problem because people reading a screen blink less than normal. You can even get lenses with a special tint that changes the frequency of computer screen light, making it easier for your eye to absorb and making the screen easier to read. If I moved my computer monitor close enough to see the screen clearly, it was nearly in my lap. If I left the monitor where it should be, I had to lean forward awkwardly. During my annual eye exam, I told my optometrist about my workstation discomfort and the strain it was causing my eyes, neck and back. 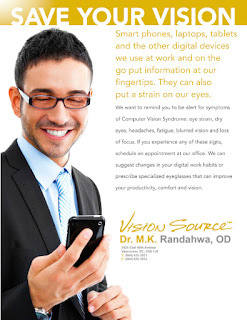 Eyestrain, headaches, blurred vision, dry eyes, and neck and shoulder pain are common complaints of someone experiencing computer vision syndrome, according to the American Optometric Association. If you optimize your work environment for comfort and still have problems, the solution may be another pair of glasses, the association says. Normally, I’d be skeptical of a trade association suggesting that I buy more of their wares. But studies have found that a majority of people who work on computers or hand-held devices experience some vision problems, the association said. “During computer use,” Dr. Heiting said, “our eyes not only have to stay focused but also have to stay properly converged for long periods of time,” referring to the ability to move both eyes inward. The glasses people use for driving or the ones they use for reading books often have the wrong focal point for computer use or are ill-suited for computer use. This convergence fatigue can cause eyestrain and blurred vision, just as focusing fatigue does, he added. What is more, computer workers blink much less frequently than they would during a face-to-face conversation, and that leads to dry eyes at work. Here is some more information on computer vision syndrome. When a child struggles with reading, learning can be challenging. How can you help? If you are like most parents, you have already checked their vision ... or have you? People often assume that if their child sees the letters on the eye chart when tested by the nurse or at the pediatrician's office, then they have all of the skills that are needed for reading and learning. Most people don't realize that the standard eye-chart test does not uncover all potential vision problems. In fact, having 20/20 eyesight simply means that one can see a certain size letter at a distance of 20 feet. However, measuring visual acuity alone may not uncover other serious vision problems. Vision is a much more complex process that involves many different visual skills. Undiagnosed vision problems can make it difficult for a child to make sense out of what they read. They then do poorly on written tests. This can lead parents and educators to think that the child is just lazy, not trying hard enough, or may have a learning disability, such as ADHD. One of the most important steps a parent can take is to schedule a developmental vision evaluation even if your child has had previous vision exams or screenings. Undiagnosed vision problems can make it difficult for a child to make sense out of what they are reading, causing poor performance on written tests. According to neurologists Drs. Fernette and Brock Eide in their new book “The Mislabeled Child,” if a child has a vision problem it can have “drastic effects on brain development, learning, and thinking if it prevents the flow of accurate information to the brain.” Too often parents assume that if a child passes a vision screening that everything is fine with their eyes, and that couldn't be further from the truth. To learn more about vision problems that can't be fixed with lenses and need the intervention of a developmental optometrist visit http://www.covd.org/. or http://www.visiontherapy.ca/. There has been research recently on the connection between ADHD and eye movement problems such as convergence insufficiency. Click here to learn more. If you are interested in vision and learning, click here. Strabismus - a condition where the eye abnormally turns in or out due to one or more of the eye muscles malfunctioning - is often treated with surgery in which the properly functioning muscle is cut and re-attached so that it balances with the malfunctioning muscle, hopefully making the eyes look straight. Strabismus surgery has well many well-known risks and complications. However, there is a growing body of research that is causing even more worry for strabismus surgery patients because these patients are often very young and must frequently endure repeat surgeries, which means repeat exposure to anesthesia and therin lies the risk. Recent research suggests that the risk of developing learning disabilities and attention-deficit/hyperactivity disorder (ADHD)increases after early exposure to surgeries requiring general anesthesia - surgeries like strabismus surgery. Eye surgeons often lament the need for repeat eye surgeries for strabismus patients. Surgeon, John W. Simon, notes that "patients must regularly contend with the unfortunate reality that even the most accurately planned and carefully executed surgery may not totally eliminate the deviation [i.e. the misalignment of the eyes] or completely normalize rotations. In addition, strabismus tends to recur over time." 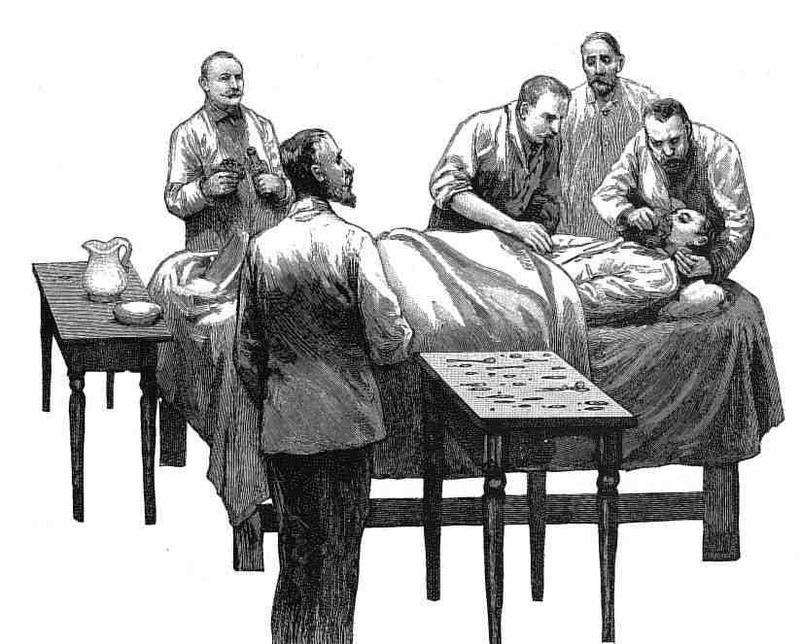 This limitation of sugery often results in the the patient being subjected to repeated surgeries - all of which may be unsuccessful. It is not uncommon for a patient to have had two or three or more surgeries and still have a noticeable misalignment or poor binocular vision together with depth perception problems or all three. For this reason, the surgeon's view is that "strabismus is less a problem to be cured than a problem to be controlled, with the minimum number of surgeries": Simon, John W. Complications of Strabismus Surgery. Current Opinion in Ophthalmology. 2010. 21: 361-366. One study found that only 45% of children had successful alignment of the eyes at an eight-year follow up to their strabismus surgery. And while the low percentage was disappointing enough, 20% of the children had to undergo repeat strabismus surgeries which were ultimately unsuccessful: Awadein A, Sharma M, Bazemore MG, et al.Adjustable suture strabismus surgery in infants and children. J AAPOS 2008; 12:585–590. The latest study to link repeated anesthesia exposure to learning/behavioral disorders was published by researchers at the Mayo Clinic in February, 2012 in Mayo Clinic Proceedings. It linked repeat surgeries requiring anesthesia to a doubling of the risk of developing ADHD. The study's authors concluded that "children repeatedly exposed to procedures requiring general anesthesia before age 2 years are at increased risk for the later development of ADHD even after adjusting for comorbidities." The February 2012 study follows up on earlier studies that linked repeat surgeries requiring anesthesia to an increased risk of developing learning disabilities. The authors of an October 2011 study on anesthesia and learning disabilities published in the journal Pediatrics stated the alarming conclusion that "[r]epeated exposure to anesthesia and surgery before the age of 2 was a significant independent risk factor for the later development of [learning disabilities] but not the need for educational interventions related to emotion/behavior. We cannot exclude the possibility that multiple exposures to anesthesia/surgery at an early age may adversely affect human neurodevelopment with lasting consequence." Similar results were published in a 2009 study published in the journal Anesthesiology which looked at children under the age of 4 who were exposed to anesthesia. The researchers concluded that “exposure to anesthesia was a significant risk factor for the later development of learning disabilities in children receiving multiple, but not single anesthetics. These data cannot reveal whether anesthesia itself may contribute to learning disabilities or whether the need for anesthesia is a marker for other unidentified factors that contribute to learning disabilities." The three studies referenced above were undertaken after studies in animals showed that repeat exposure to anesthesia at a young age caused damage and degeneration in the brain that manifested in the animals as learning and behavioral problems. The research conducted so far in humans indicates that the worrisome findings from the animal studies apply to humans as well. Is general anesthetic used for young patients undergoing strabismus surgery? While topical and local anesthesia are used for some strabismus surgeries in certain patient demographics, it appears that general anesthetic is commonly used for children younger than the mid-teens. Click here to read more about anesthesia use in strabismus surgery. According to Cyber-Sight, a program of ORBIS International, a non-profit organization that prevents and treats blindness by providing quality eye care, "most immature patients (younger than midteens) require general anesthesia for extraocular muscle surgery." Because doing strabismus surgery early in life is generally considered important to its success, surgery in children younger than age 2 is not unusual. Surgery for strabismus is done as early as 3 months of age in serious cases, particularly if the strabismus is detected early. Given the potential for very bad outcomes following repeat surgeries and the high risk of repeat surgery for strabismus, it is prudent to employ non-surgical treatments where they are available. Vision therapy is an effective non-surgical treatment for most kinds of strabismus. The success rate of vision therapy treatment of strabismus is in the range of 75%-87%. Unfortunately, some forms of strabismus do not respond well to vision therapy and surgery may be required. If surgery is necessary to treat a young patient, surgical approaches that do not rely on general anesthesia, if they are available, should be considered. While the studies referenced above looked at very young children, at what age does the risk of of learning and behavioral disorders diminish and at what age does it disappear? Does the risk ever disappear? We don't know the answer yet but we know that the brain continues to develop until the age of about 25. What is the risk of damage during the full 25 years of brain development? Patients contemplating strabismus surgery should have a frank discussion with their doctor and raise the issue of repeat surgeries and the risk of learning disabilities and ADHD that comes with repeat exposure to anesthesia. Also note that strabismus surgery has other complications and risks in addition to the risk posed by repeat exposure to anesthesia. A survey conducted in the United States shows that most adults are unaware that 10 percent of infants have an undetected vision problem, which, if left untreated, could become serious and lead to other problems. 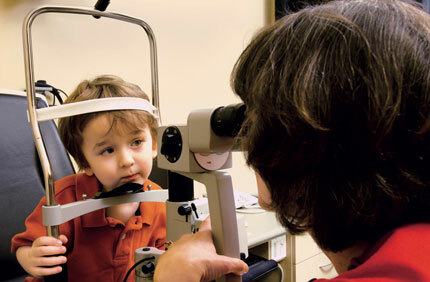 It is recommended that a child go to an optometrist for a comprehensive eye examination before the age of one. However, only 18 percent of parents who participated in the American Optometric Association's American Eye-Q survey reported taking their child to an eye doctor before the child's first birthday. Optometrists have special tests for babies to diagnose eye conditions, which allow babies to be examined before they can read or even speak. 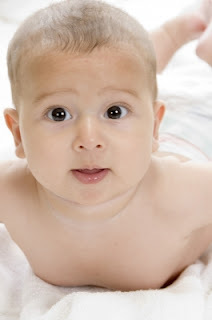 It is recommended that you take your baby to the optometrist for her first eye examination at six months of age. An infant's visual development is critical between six and 12 months of age. However, it is difficult to notice vision problems in infants without a thorough, comprehensive eye exam. Even if a child is hitting all his or her developmental milestones and not showing any obvious signs of problems, there could still be issues with the child's vision. Many vision problems are most effectively treated if caught early in life. Moreover, poor vision in infants can impair development in other respects as the infant grows. The survey indicated most parents were aware that lazy eye (amblyopia) and crossed eyes (strabismus) could be detected in infants but less than one-third were aware that cancer, farsightedness and nearsightedness could also be detected during an infant exam. To learn more about kids' vision care guildelines click here.